This is the second post in my series on Integration of Things. In my previous post I have explained the scenario and architecture, so today I will explain how you can use a Raspberry Pi 2 to act as an IoT fieldhub. The RPi2 is a low power ARM based single board computer at the size of a creditcard, which can run Windows 10 IoT Core, a windows version created specifically for these kind of boards. This also means we can use the .NET framework to set up our solution. The code for this post can be dwonloaded here. First we will have to flash your RPi2 with Windows 10. There are some great walkthroughs out there, so I will not explain this here, but instead link you to this site which will explain all the steps to be taken. After we have flashed our RPi2, it’s time to set up Visual Studio. To develop on Windows IoT Core, we will need to install the project templates. This can be done from Visual Studio by going to Tools, Extensions and Updates, and searching for Windows IoT Core Project Templates. 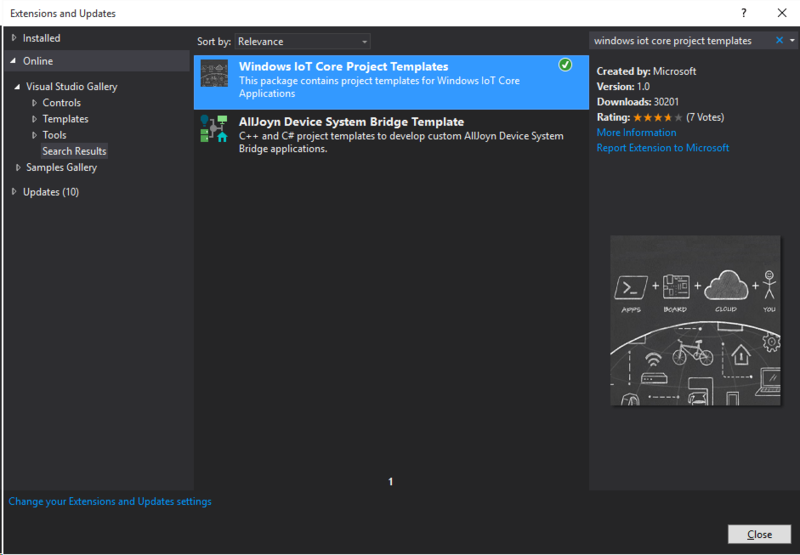 Install these templates, and restart Visual Studio to start creating your own IoT solutions. Don’t forget to enable developer mode on your machine by following these instructions, as this is needed to publish your solution to your device. Last year I did an IoT session at the Dutch BizTalk User Group, and since then I have had several requests for more information on this topic. After having had a couple of very busy months at my client, I finally decided to make a series of blogposts on this topic. IoT is a major growing industry, and gives a lot of really nice opportunities for us integration specialists. All the code and projects I will be creating will be provided along with the posts, and can be downloaded from here. Coming from a nautical background myself, I see more and more scenarios here where IoT might be a real game changer, so this will be the scenario I will be using throughout these series. In the upcoming weeks I will be creating my blogposts from the following scenario. 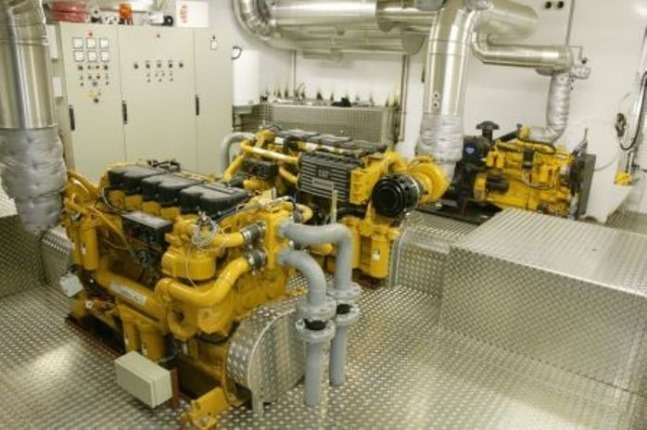 In this scenario an engine supplier for ships, like Caterpillar or ABC, might want to get information about the health and status of their engines. In general, a ship has several engines for propulsion (main engine and bow thrusters), generators, pumps on tankers, etc. All these engines already have a lot of data about their health, like temperatures, oil and filter conditions, or issues that might occur during operations. Currently most of this information is displayed to the crew of the ship, and they have to interpret this information, which often means issues are not noticed until it becomes a real problem, and they have to go in for repairs or adjustments, where every day they are not out working can cost a lot of money, especially if the ship is working under contract.